Fresh new vinyl colors stitched to a coarse-weave black nylon band. 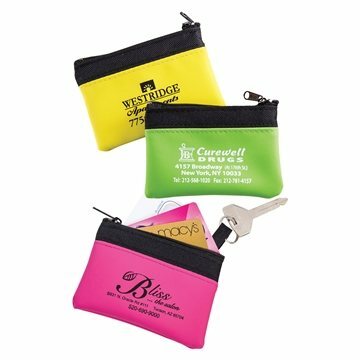 Pouch neatly stores coins, cash, parking stubs, receipts,ATM/phone/credit cards, loose papers. Keyring strap attaches inside the pouch keeping keys secure. Nylon zipper will never rust or snag. Thanks for a wonderful sales person who worked with me Much prettier in real life than on the website. there is nothing I really dislike about the product It appeared as if it had been top quality. I like the material quality of the product and print logo also looks good Top quality in a very affordable cost.